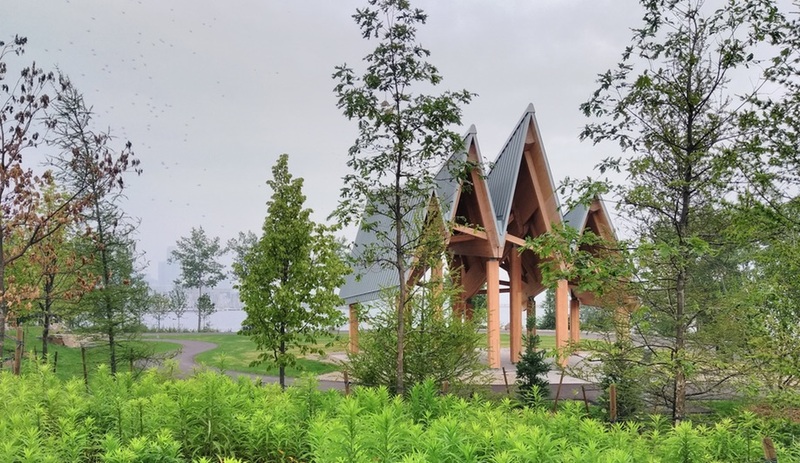 The recent opening of Trillium Park, in Toronto, brings new green space to the city and marks a promising start to the revitalization of Ontario Place. 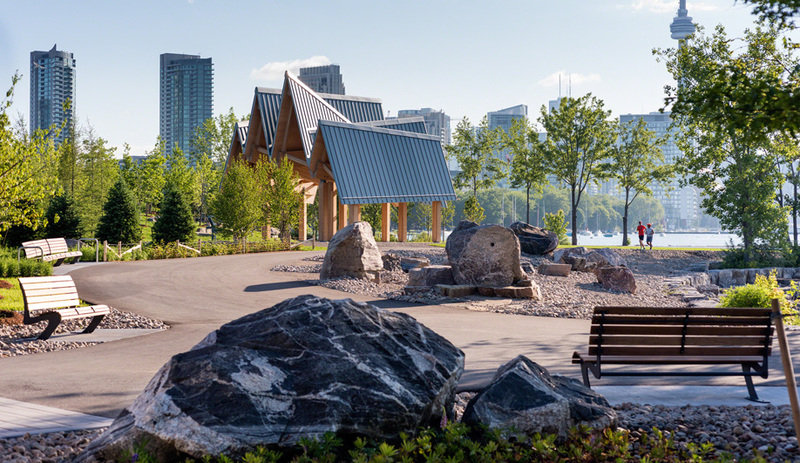 When it opened in 1971, spread across three artificial islands in Toronto’s west end, the Ontario Place theme park was a state-of-the-art, family-friendly attraction with an emphasis on outdoor entertainment. 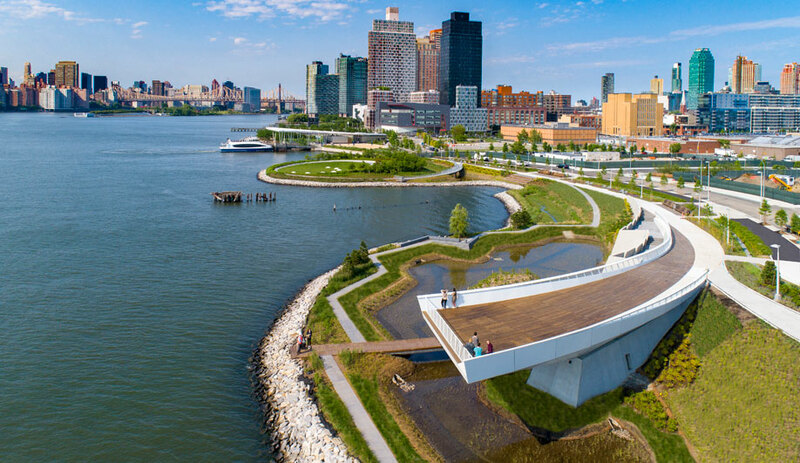 But even in the park’s heyday, the east end of the islands were never seen by tourists, as it was turned over to employee parking. 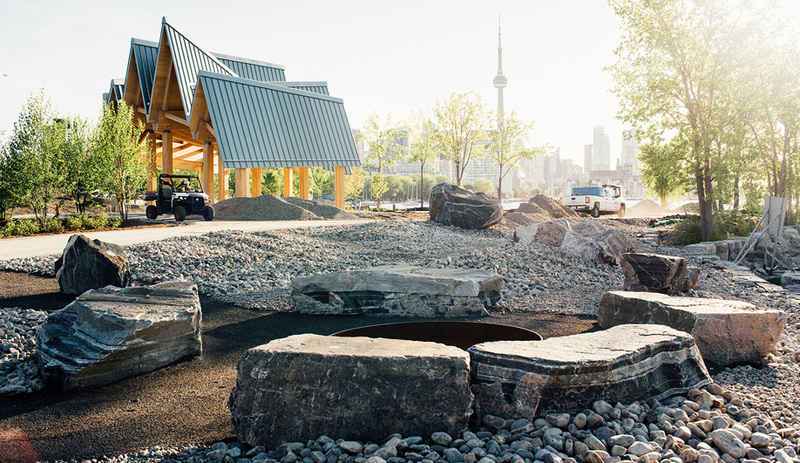 This began to change when the park closed for redevelopment in 2012. 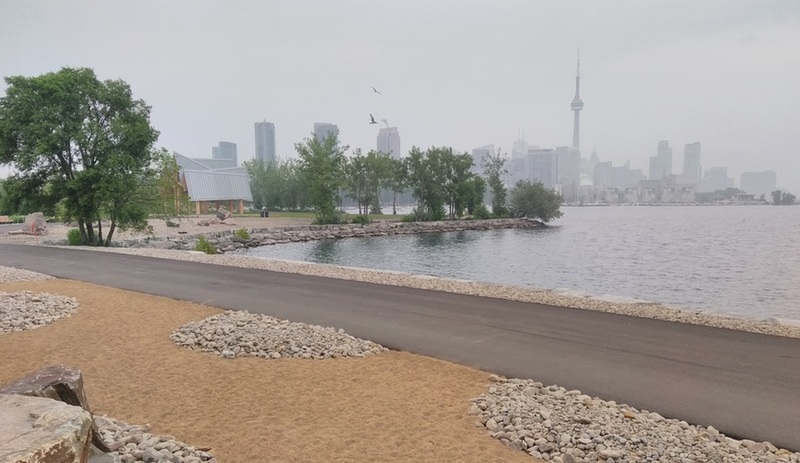 Last month, after two years of construction, the first phase of a new and improved Ontario Place opened to the public. 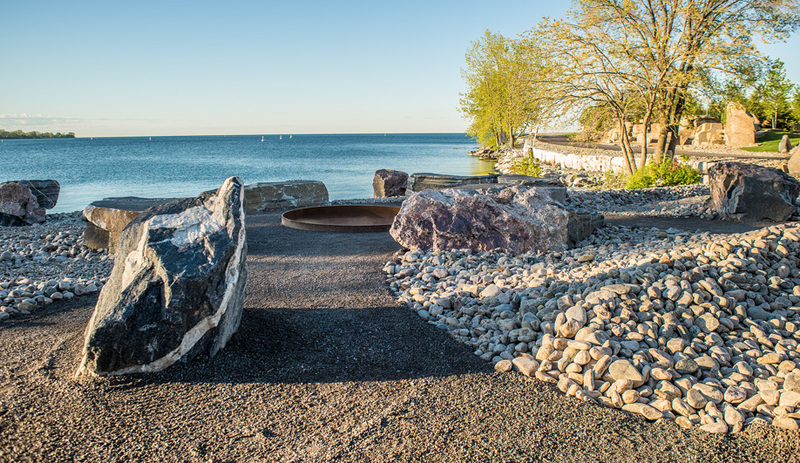 Running the length of the largest island’s eastern shoreline, Trillium Park and William G. Davis Trail adds three-hectares of new public green space to the city. 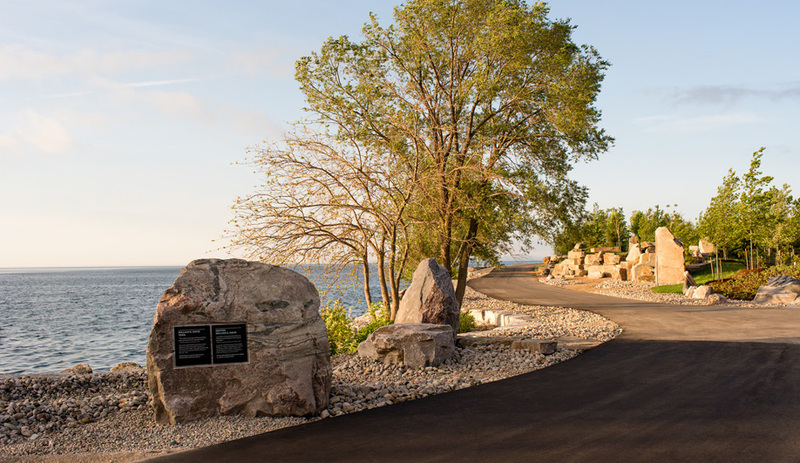 Where there was once a barren parking lot, visitors can now find walking trails that wind through a hilly patchwork of wilderness-inspired terrain, from sand and boulders to grassy knolls and meadows full of native wildflowers. 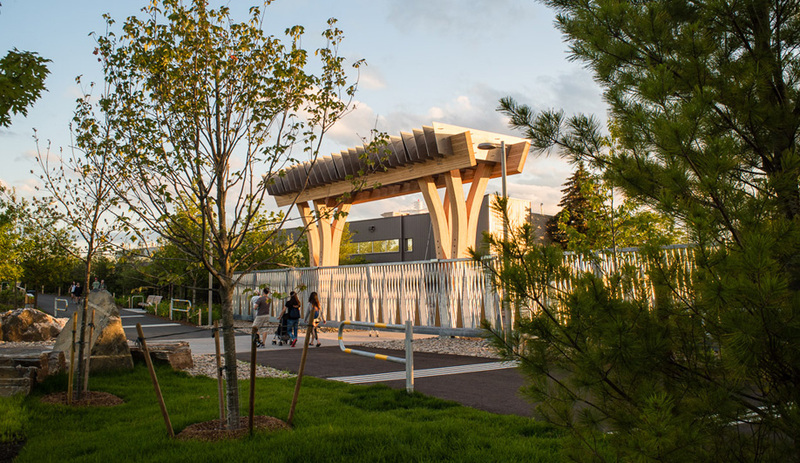 Ramping the site gently up toward the north side and covering the steep downward incline with a woodlot also breaks sightlines to the service road and administration buildings below. 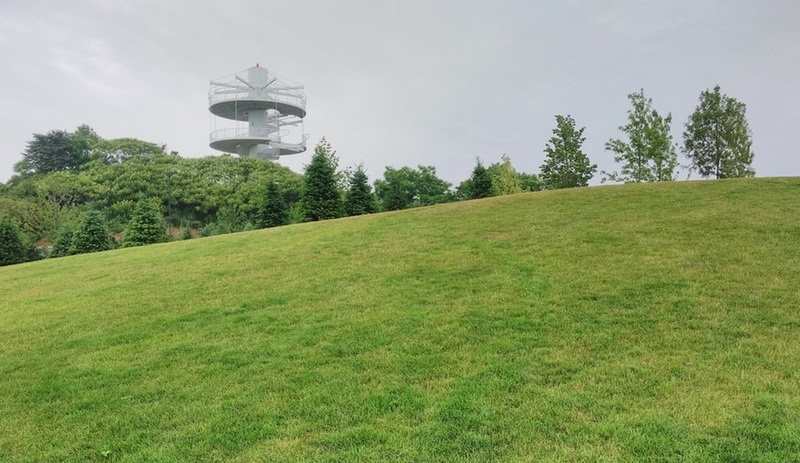 From atop the ridge, the view to the north is primarily sky and trees, even though utility space is just a few steps away. 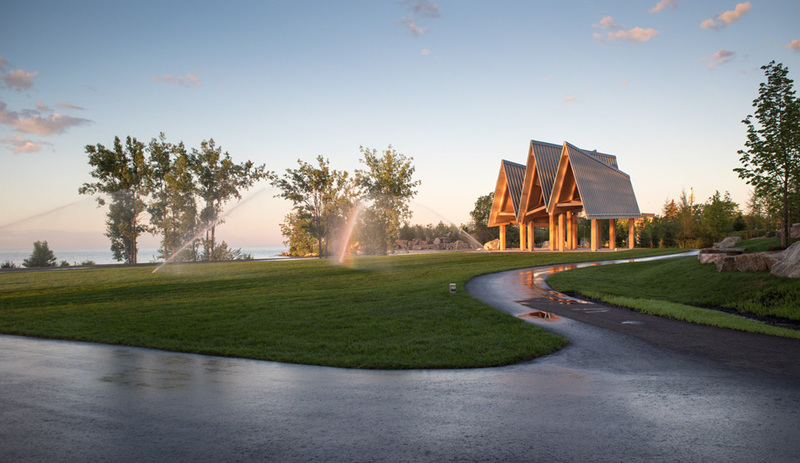 Along this undulating terrain, LANDInc has incorporated a few built structures, as well as areas defined by their use of different plantings or materials. 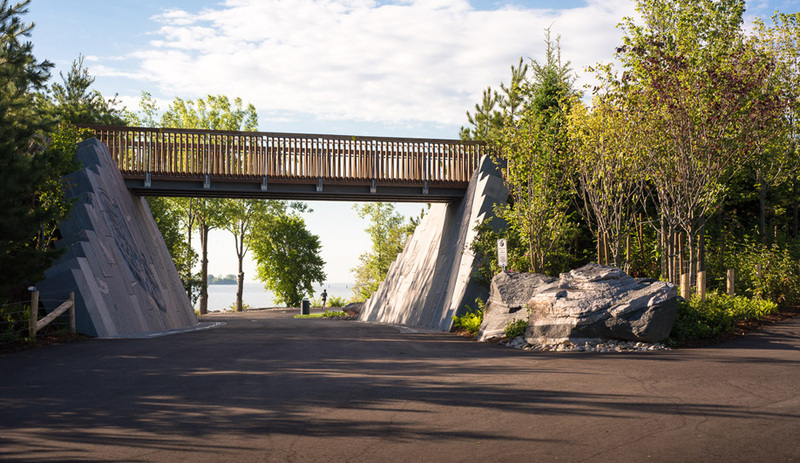 One of the first structures visitors encounter on entering from the city is a footbridge-topped ravine, whose sides are lined in 140 slabs of pewter-grey Northern Ontario granite and inscribed with a moccasin engraving. 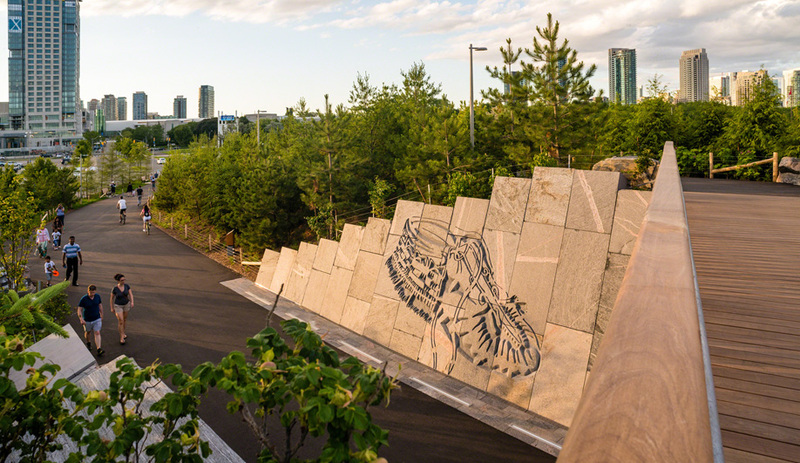 This mural, like the marker trees scattered throughout the park, are a nod to the traditions of the Mississaugas of the New Credit First Nation, members of which were crucial advisors during the park’s three-and-a-half year public consultation process. 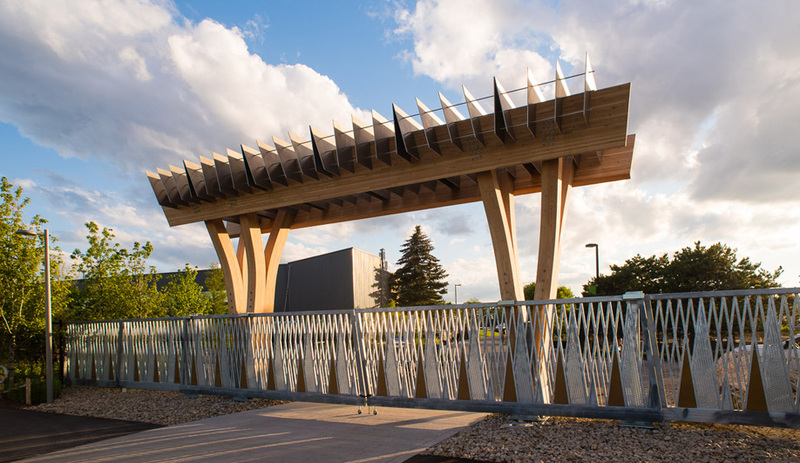 Further along the path, a towering gate, with galvanized steel doors and a glulam arch topped in slanting aluminum plates, will eventually lead to the heart of a completely reimagined Ontario Place. 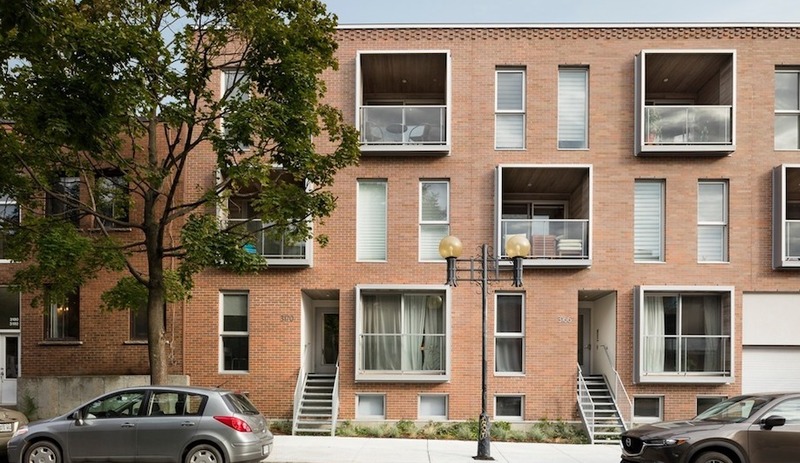 Close by, a pavilion based on a concept devised by redevelopment master-planner West8 offers the final architectural focal point. 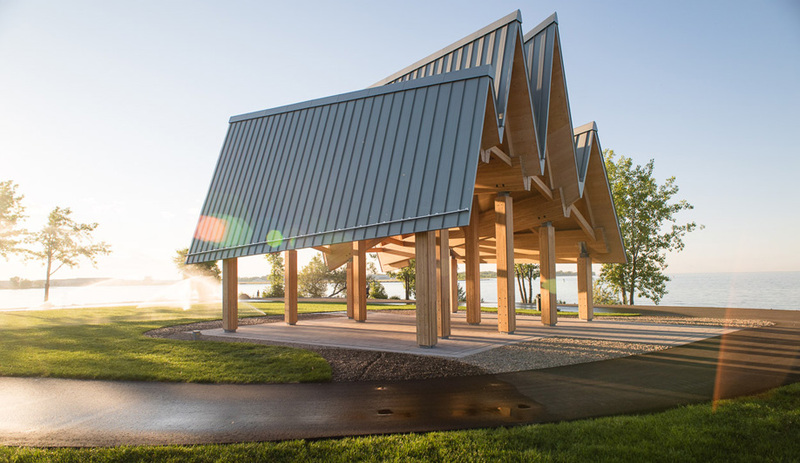 Like the gate, the pavilion is topped with steeply slanting lines — a reference to the peaks of evergreen trees. 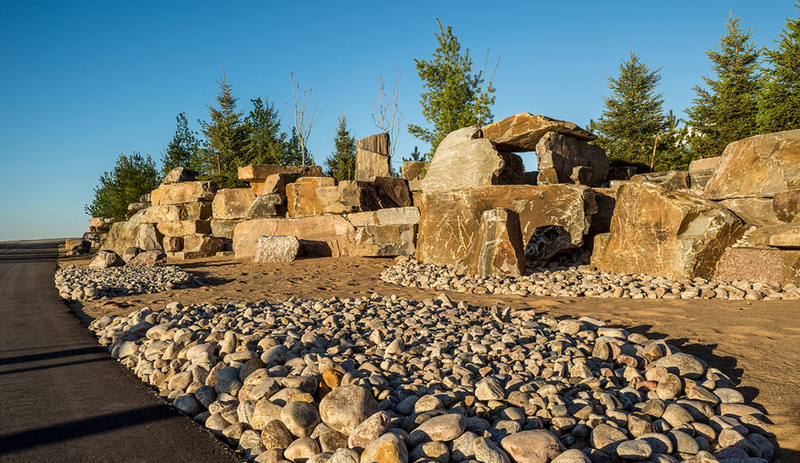 LANDInc used stone to create a range of textures throughout the park, including a beach of river rocks piled around winding pebble paths. 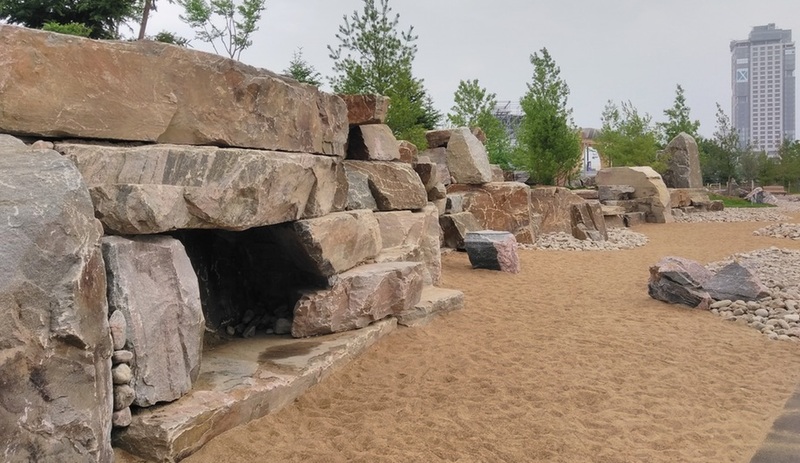 And, at the centre of the park, in what’s sure to be a kid-pleasing attraction, the designers included a climbable bluff assembled from 1,540 tonnes of Muskoka granite; the largest of these boulders weighs 47 tonnes. 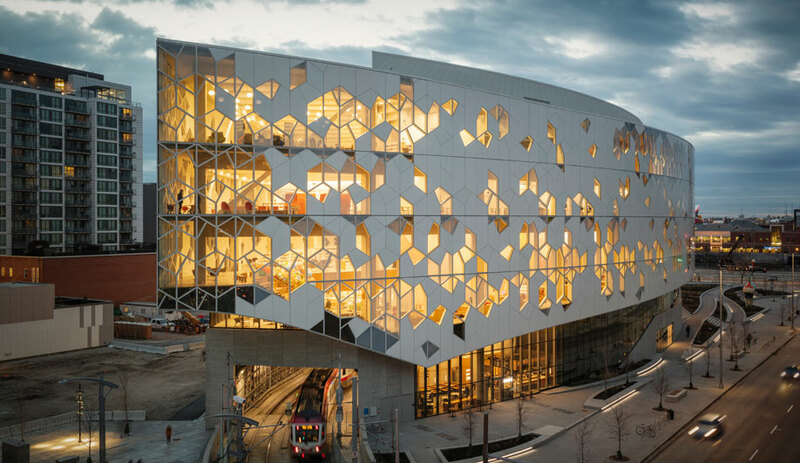 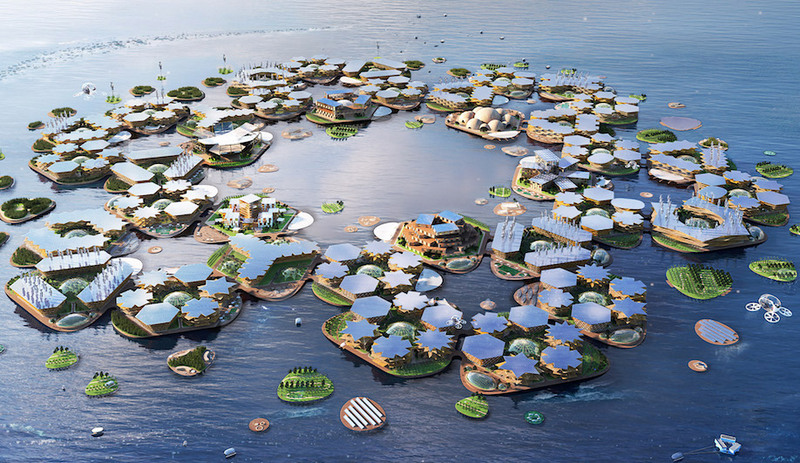 “It’s symbolic of a glacial moraine,” Morello says. 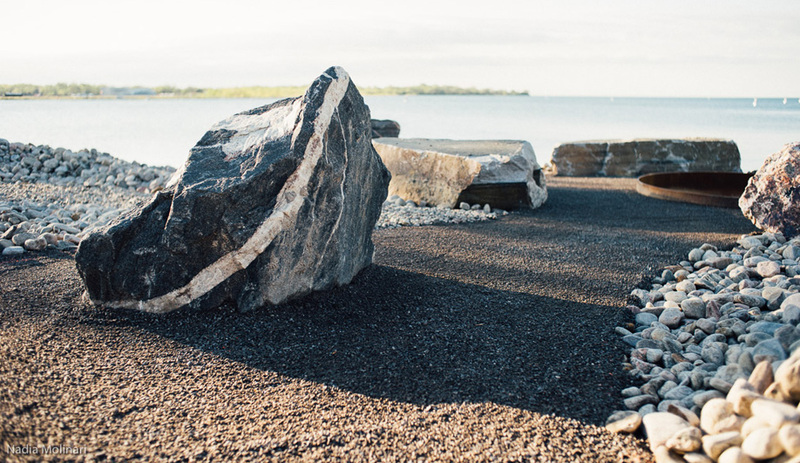 “We spent days at the quarry trying to find unique stones; each one was hand-picked by our office. 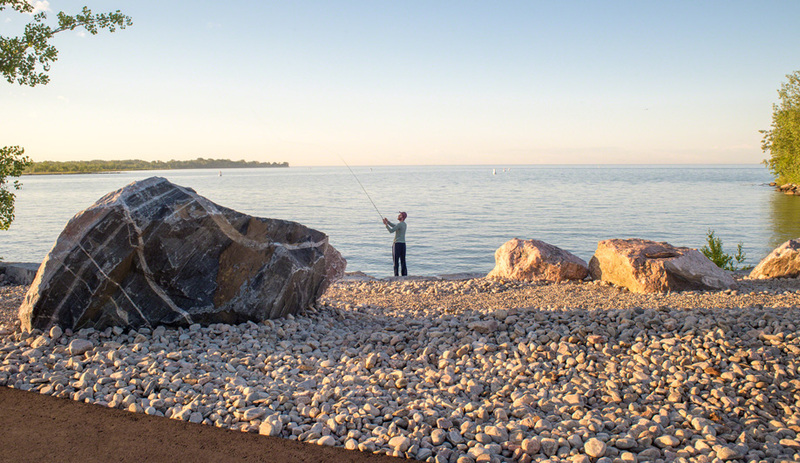 In fact, one day, one of the grandkids of the stonemasons was playing around on the rocks, so we watched him to discover what he was drawn to, and found some really unique stones.” The final composition was decided at the quarry, then carefully mapped and reassembled at Ontario Place using GPS and surveying tools. 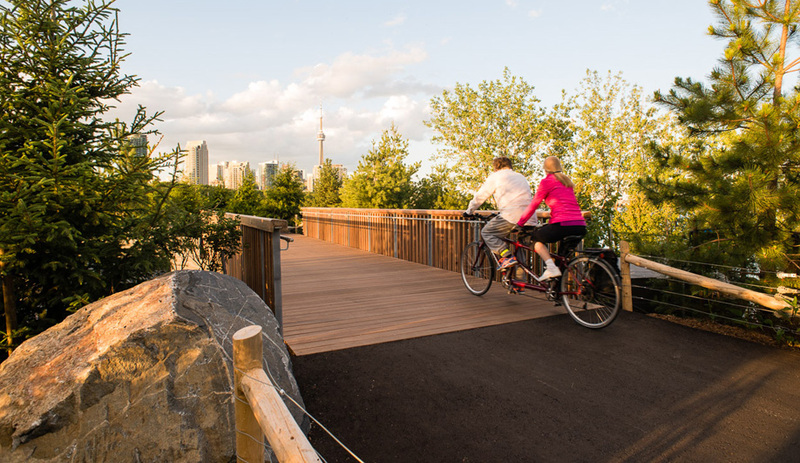 But Trillium Park’s real draw is its greenery. 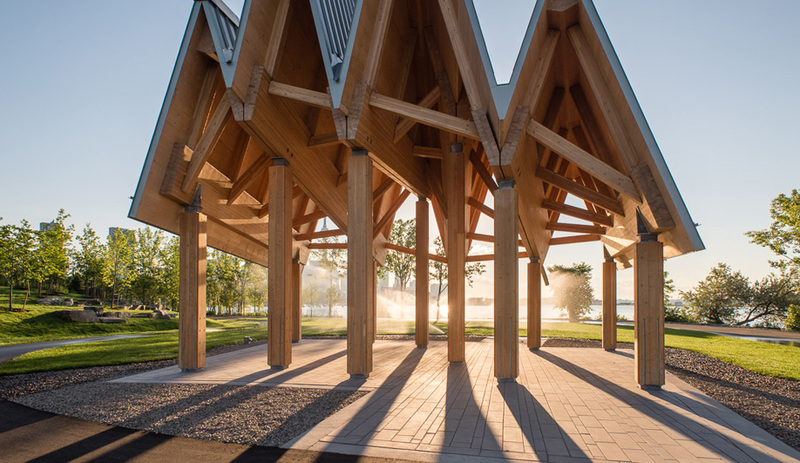 An investment in 28,000 shrubs and 1,200 trees — and especially older red oak, red pine and sugar maple, rather than saplings — pays off; already, the park feels like a thriving ecosystem, and has attracted red-winged blackbirds and cedar waxwings. 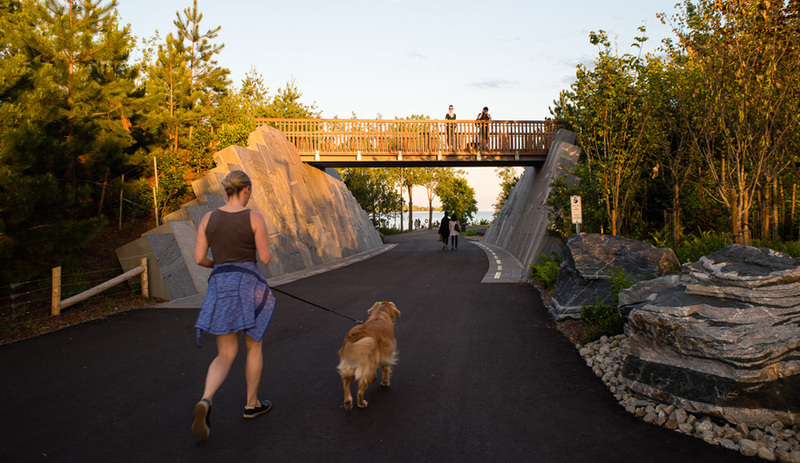 Elsewhere, guests can wander across grassy meadows, the largest of which is the Summit, a hill at the end of the trail, inspired by northern Ontario’s drumlins.